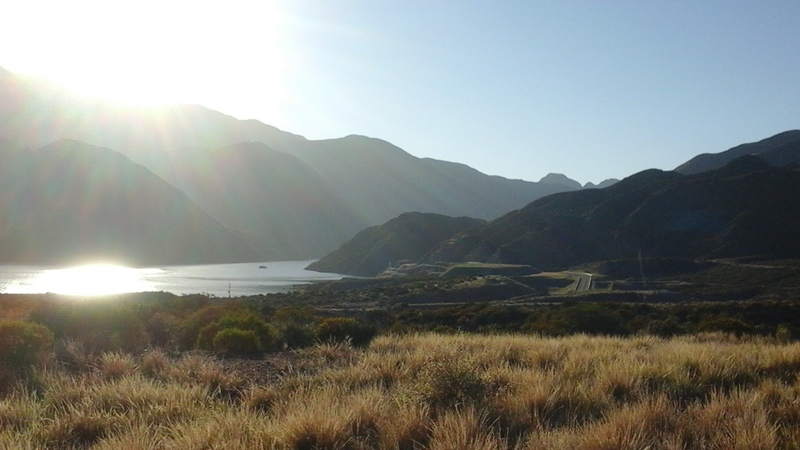 You can’t spend five weeks in Argentina and not visit the famous region of Mendoza where malbec wines reign supreme. 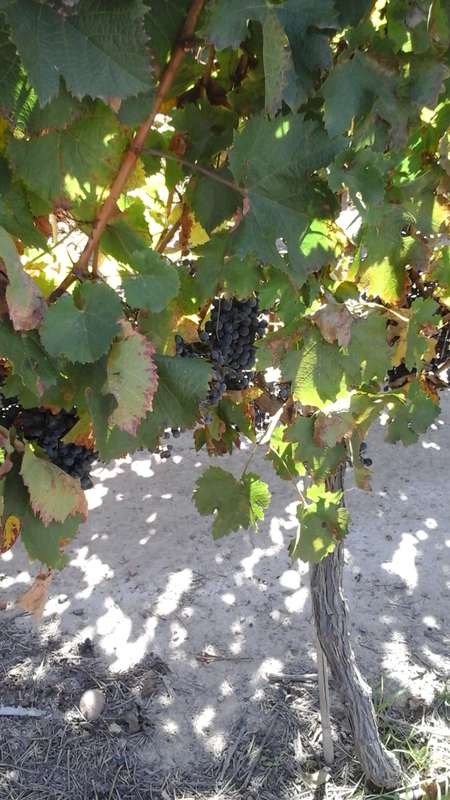 But wait a minute there is more to Mendoza than wine. 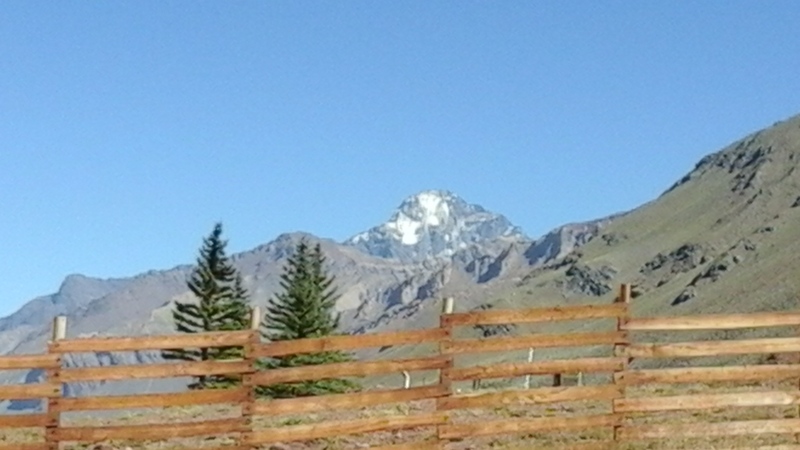 Did you know that the Andes mountains with their snow-capped peaks are not far from the wineries and can be easily accessed in a day? After three months of travelling on our own, Hubby to his favourite haunt in Florence and me to Ecuador, we have finally met up in Buenos Aires which will complete our winter escape for this year. I am returning for the second time, having landed here in January, to this bustling, cosmopolitan city and am glad to report it has cooled down a bit as their fall season approaches. 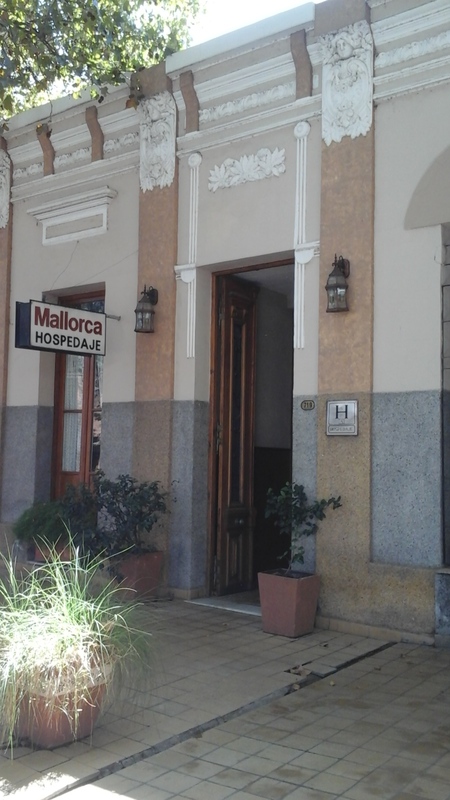 One of the first things on Hubby’s bucket list was to pay a visit to Mendoza while we were in Buenos Aires so with that in mind I had booked us into the Mallorca Hotel for four nights some time ago. After a long, but fairly comfortable overnight bus ride from Buenos Aires to the city of Mendoza which is approximately 1050 kms. to the west towards the Andes mountains, we decided to take it slow and simply try to orient ourselves to the city proper which has a population of about 115,000. Compare that to about 3 million in BA and you have a good reason why some visitors get caught in the ‘trap’ as Lonely Planet likes to call it. 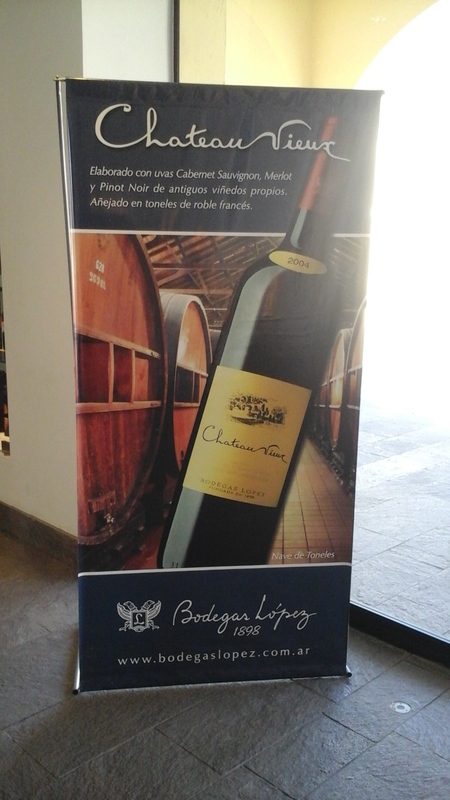 Visitors often come to Mendoza for a few days to sample the wine and end up staying for weeks at a time. With over 400 wineries or bodegas as they are called in Argentina at your disposal, a wine lover could spend a year here just going for wine tastings. One of the first things our wonderful host, Mariano, at Mallorca did was to present us with the various options of what tours we could take with their price ranges making it really helpful to narrow down our choices at a reasonable price to suit our budget. 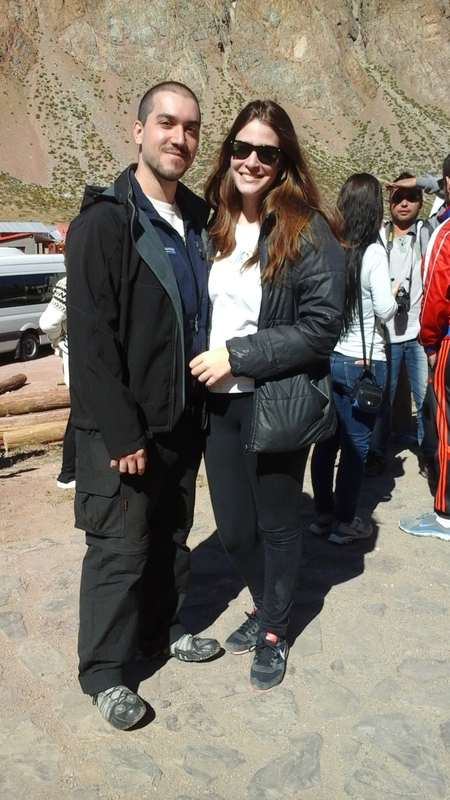 We felt absolutely no pressure from him so we immediately signed up for a half-day wine tour on the Saturday and a whole day tour of the Andes on the Sunday. It was no surprise to me that Hubby wanted to put some wine tasting at the top of his list of ‘to dos’ which I had no trouble with since I do like wine. However, the problem is that it doesn’t like me a whole lot and will often make me feel very tired. 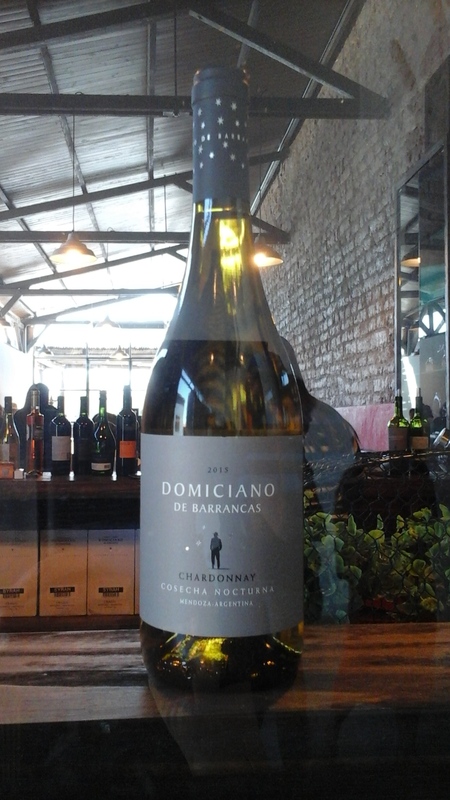 But, hey, you don’t go to a place like Mendoza and not drink wine! How can you when Mendoza can easily boast of being one of the world’s largest wine regions, as well as producing more maldec than any other country. Actually the grape that produces this rich, burgundy red wine was first successful in France but was soon taken over by Argentina because the dry but cool climate of Mendoza is ideally suited to it. 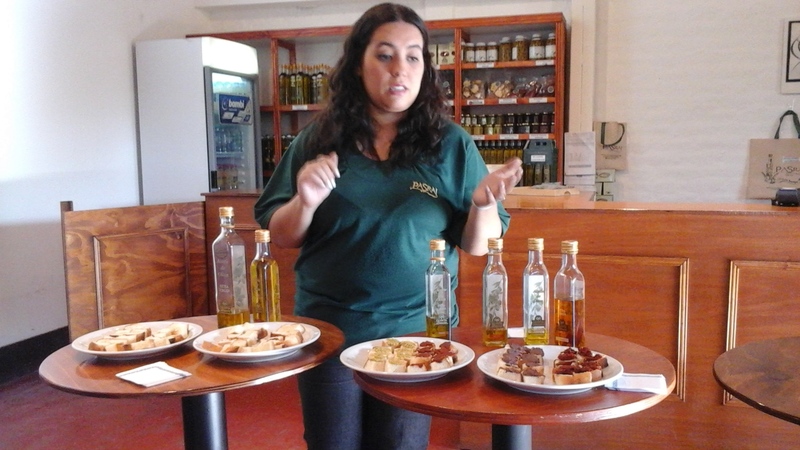 By the end of our stay, we had visited four bodegas and one olive oil plant. By far, we found the best bodega just a hop, skip and a jump from the centre of the city. 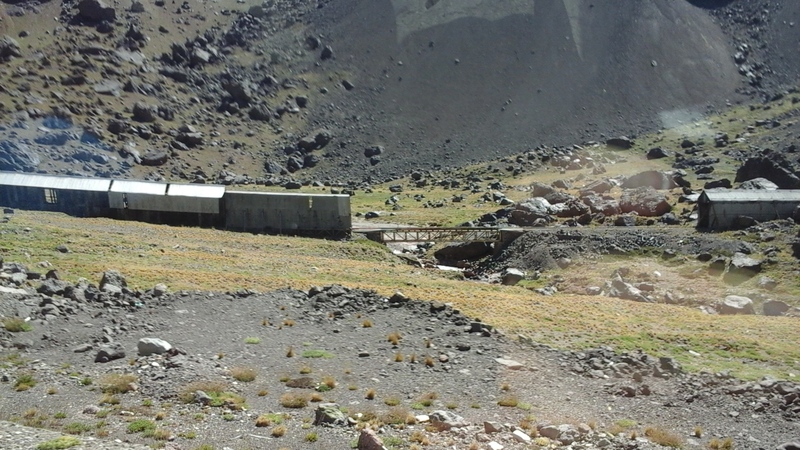 It was Bodega Lopaz which we reached by taking a newly resurrected train to the city’s outskirts. Here we were treated not only to generous and free tastings, but also wines which we thought were far superior to any others we had tasted. On top of this, their prices were definitely lower than any of their competitors, and the staff went out of their way to be helpful in making our selection of wines to buy and packing them up for us. 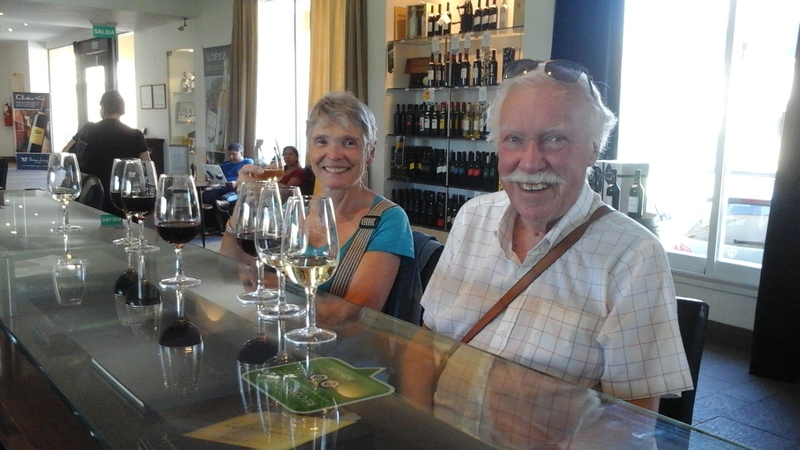 I also thoroughly enjoyed our visit to the Pasrai olive oil plant probably because I needed some good food to absorb all the wine I had tasted on our tour. Our guide led us through the olive oil making process and then offered plates of bread with various spreads and oils to wet our palates. Putting in a great sales pitch for a line of body lotions made with their olive oil, our guide convinced me that I definitely needed this natural product for my poor body which has taken such a beating with my travelling lifestyle. Hubby opted for a large bottle of olive oil which he swears he will finish before we leave. He’s going to be doing much of the cooking and probably will succeed as he loves to douse everything he cooks with the stuff. 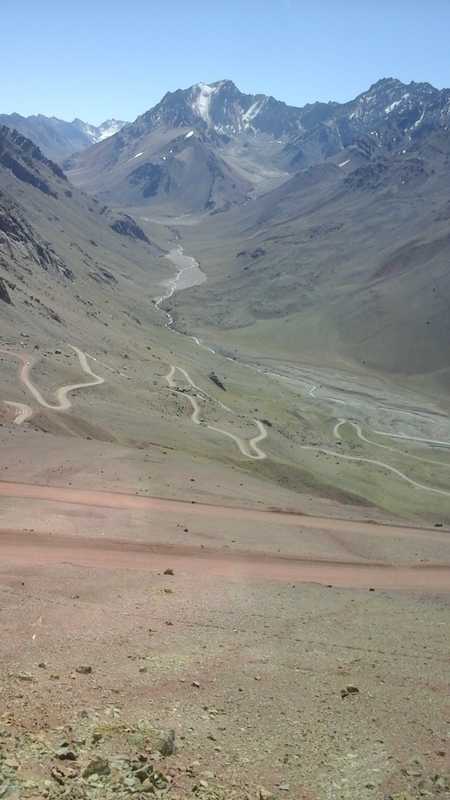 With more than enough wine tastings under our belts, I was glad when our tour to the Andes finally arrived. This was one tour that didn’t disappoint and was definitely worth the money. However, it did present us with some unexpected surprises. The Andes are the largest continental mountain range in the world. Like all mountain ranges they are teeming with minerals and ores which we know was the lure for the Spaniards and Portuguese who discovered this in the 1500 and 1600’s. 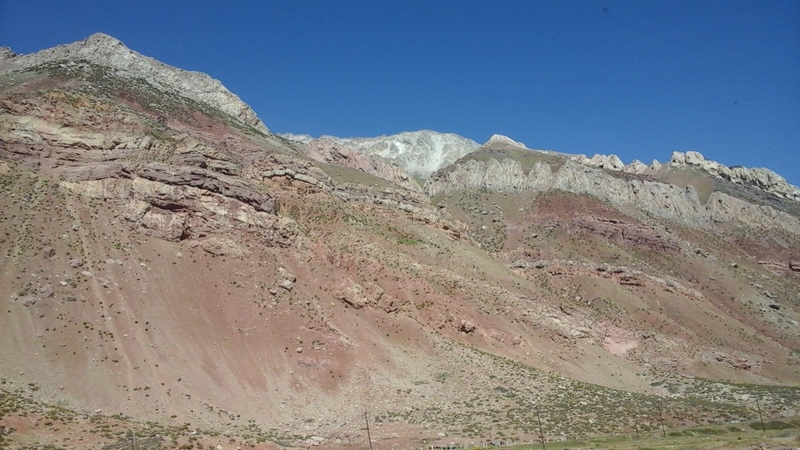 Our guide pointed out to us that the different hues of colour that we could see represented some of the minerals in this central part of the Andes: the green denoted bronze, the yellow was sulphur, and the orange was copper. Add to this the snow-capped peaks appearing every so often, we had lots to keep our attention until we made our first stop at a tranquille lake. It was still quite early in the day (about 9:30) so the effect of the rising sun made for a rather dramatic effect. Old rail road connecting Argentina to Chile built by the British. No longer in use. Thankfully, our next stop was for coffee and some food which was so welcome since we didn’t have time to have anything before our 7:30 departure other than some bananas. As I have mentioned before in my posts on Ecuador, to not speak Spanish is a real liability in any South American country. This problem has certainly been the cause of many of my challenges which I thought might improve with Hubby by my side, but unfortunately not so. As it turns out his Italian isn’t of much help except for basic words which are similar to the Spanish, and in many cases just confuses any Argentinian who has no English. The first surprise on this tour happened when our bus came to pick us up at our hotel and our guide asked us if English was our only language. He was as surprised as us when we told him that, yes, we were English and did not speak Spanish. He quickly caught himself and graciously promised that with his limited English he would do his best to give us some information. My heart sank at this disappointing turn of events. However, like so many other episodes on this trip, just when you think the world is collapsing all around you, something or someone appears to save the day. This happened to us as soon as we found our seats at the back of the bus. No sooner were we seated when the pretty young girl in front of us turned around to say that she spoke good English and would translate for us. We could have hugged her! Her name was Michaela so from that moment on she and her boyfriend, Ivan, who didn’t speak English but had a good understanding of it became our bosom buddies. They did an excellent job and were delightful to talk to. We probably learned more from them than we ever could have from our guide. I just hope we were as helpful to them. We certainly shared much with them even addressing the possibility that they might like to move to a country like Canada. Ivan was all for it, but Michaela confessed she was a city girl and wasn’t keen on the cold. Michaela and Ivan our interpreters. I digress so let’s get back to our trip to the Andes because as I was to discover our surprises did not end here. 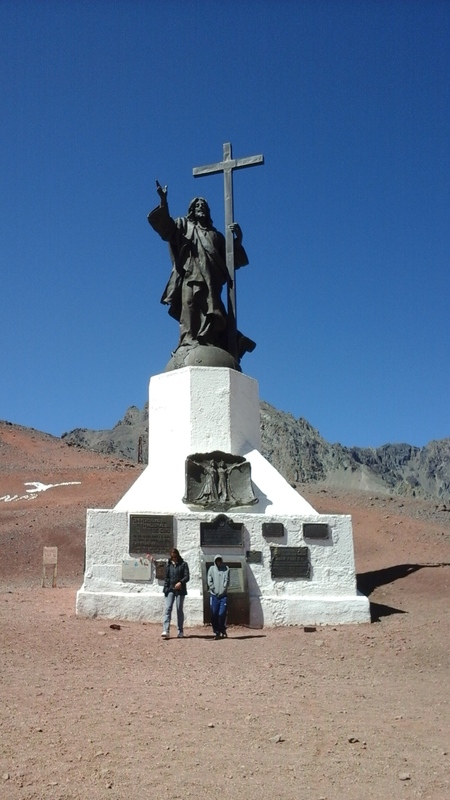 We knew that the objective of this tour was to see the Andes and its highest peak which is Aconcagua, as well as to go to the border where Argentina meets Chile so we could visit the shrine of Jesus the Redemptor. What we did not know was just how high up this shrine was and what the road would be like. During our travels in Morocco last year when we had to cross the Atlas mountains by bus, I swore I would never want to do anything quite like this again where the bus is climbing up and up ever so much further with nary a guard rail in sight. Unfortunately, I have not learned to master the technique of controlling my thoughts of the bus not making one of those sharp curves and literally falling over the edge. Try as I might by looking up, not down, or imagining I’m having fun on a roller coaster (something else I never have liked), I am still petrified. 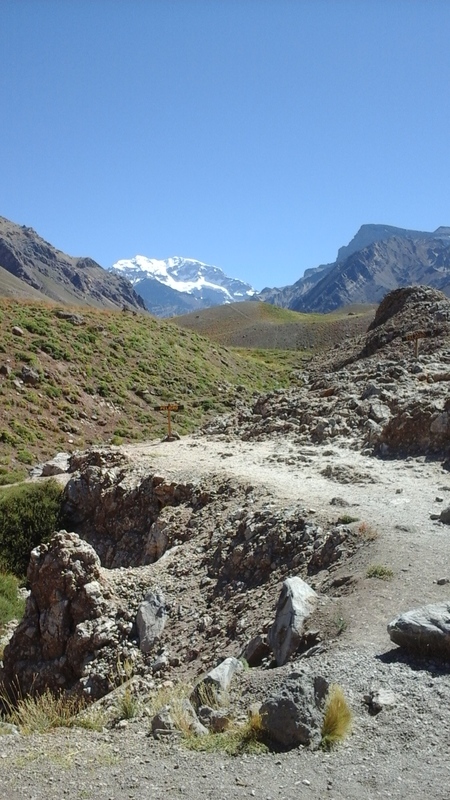 After a brief stop to have a look at Aconcagua, or the ‘roof of America’, and also the highest mountain in the world excluding the Himalayas in all its snow-capped glory, we began our ascent up to the shrine. Aconagua -“the roof of the world”. Over 7,000 m. high. I tried to get some information from Michaela on just how far up it was, but she couldn’t remember. She was so excited about the prospect of the forthcoming climb as everyone else seemed to be so I settled back believing that nothing could be as bad as what I had experienced last year and that perhaps I had conquered my fear. However, this positive thought didn’t take long to turn to the negative when I realized that quite possibly this time could be even worse. The road wasn’t paved and there was just enough room for one vehicle all the way up. There was no sign of a guard rail anywhere. Whenever our large mini-van made a particularly hair-raising turn or had to move over for another on-coming bus, everyone raised their hands and voices in applause while I in the meantime was trying to find some place where I could place my eyes so I couldn’t see what was ahead or below. Burying my head in Hubby’s shoulder helped. Unfortunately, I seemed to be the only one not enjoying this torture. Again Hubby came to my rescue by pulling out a prayer card for Saint Brother Andre. I did something I never believed I would do and that was to chant the prayer on the card over and over. All I can say is that dear old Brother Andre must have been listening because we reached the top without toppling over, and I found that coming down was much easier than going up. In fact, I was so composed that I even managed to get some good pictures of our descent. 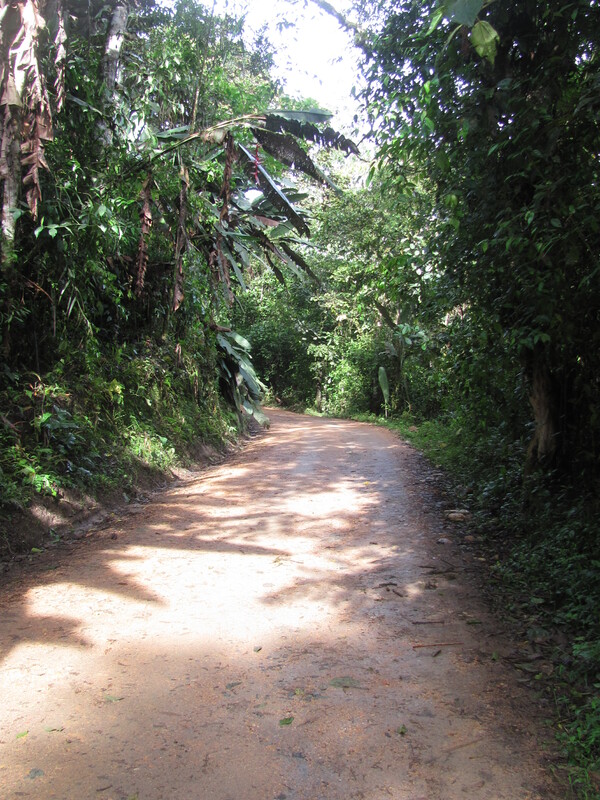 The road up to the top. In spite of the horrendous journey up, I realized that it was worth it for the incredible scenery, the story of why the shrine was there in the first place, and the hot chocolate that awaited us. 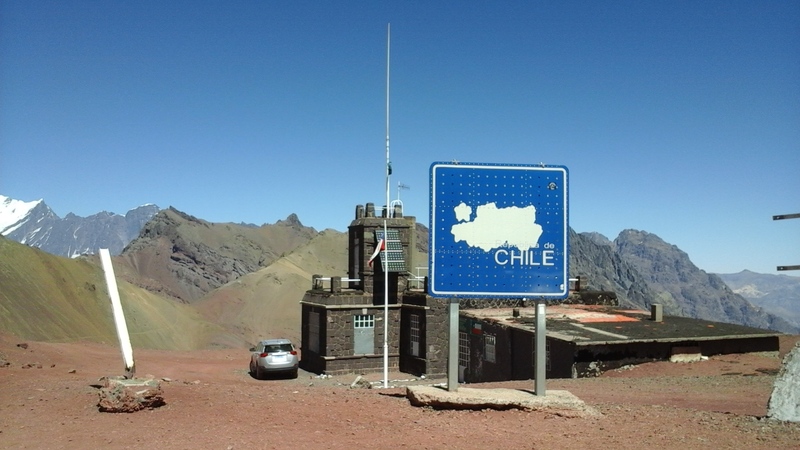 The shrine was erected to celebrate the peace treaty that took place in 1984 between Chile and Argentina. Even though they both fought together with San Martin and others to gain their independence from Spain in the 1800’s, they were never able to agree on their borders and territory so numerous war – like scuffles occurred right up until they signed their treaty and the shrine was built. Since then relations between them have improved to the point that Chile has become one of Argentina’s main trading partners. In fact, Argentina came to Chile’s rescue in a big way after their devastating earthquake in 2010. Our final stop of the day was at the site of the Puente del Inca or Inca Bridge which is one of Argentina’s natural wonders. The combination of ice from the mountains and the thermal waters from the hot springs has produced this unusual formation which acted as a bridge for many years. It was so unusual that it attracted not only his attention but an actual visit from Charles Darwin in 1835. 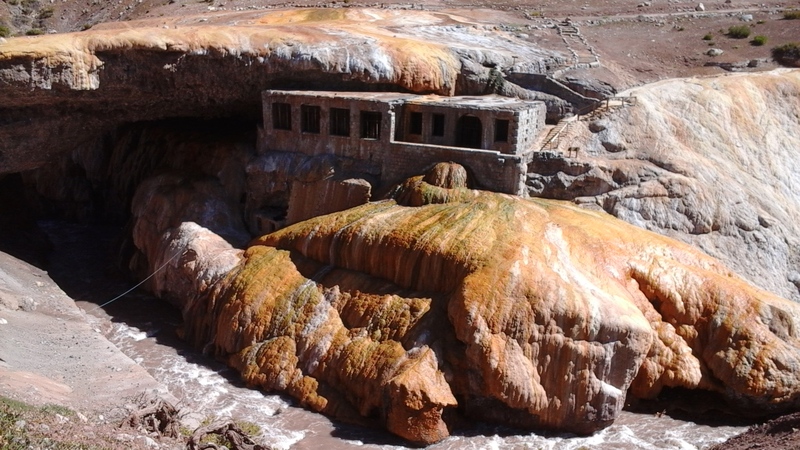 The Incan people used this bridge centuries ago and in the early 1900’s the British erected a spa to utilize the healing properties of the hot springs until 1965 when it was hit with an earthquake. Today its only purpose is to provide some photo ops for tourists. The bridge has been deemed as unsafe. Puenta del Inca with remains of the spa. 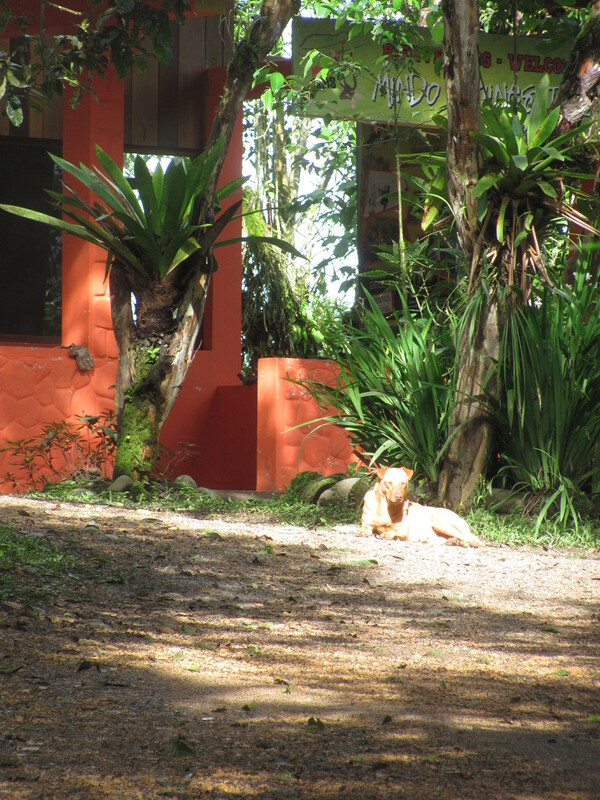 I wrote at the beginning of this post that many people who visit Mendozo often allow themselves to be ‘trapped’ there. 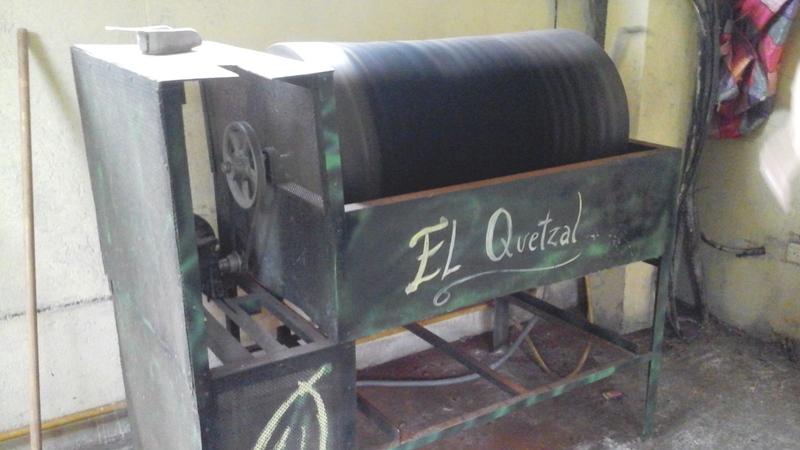 The numerous wineries alone could be one reason especially for all the wine lovers who seek the thrill of indulging their pleasure in the tastings and the ambience offered by the bodegas. 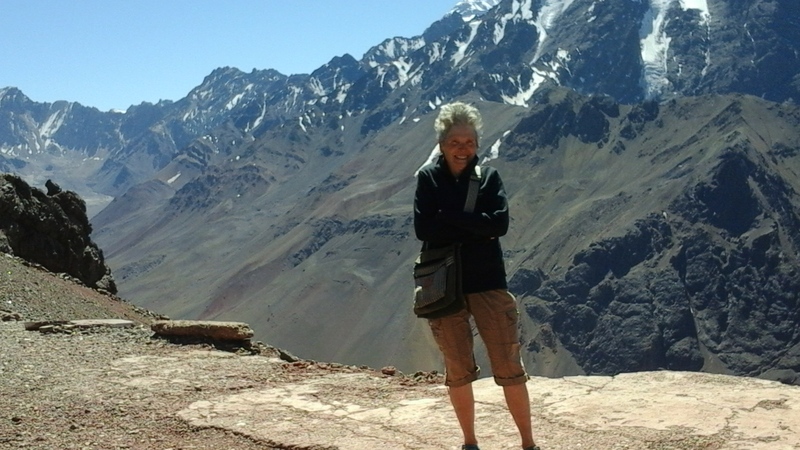 However, as I discovered the awe inspiring and, yes, often fearful Andes are definitely another draw for those who seek to know their place in nature. These mountains not only do that but also provide for us a source of adventure for those who want to take the risk. How fortunate that the city is situated right at the base of these awesome mountains in a desert like valley that produces such delicious wine. This is certainly enough for anyone to justify staying there just a bit longer. What more could it possibly offer? I found that it offers much more which I will write about in my next post. A few days ago I woke up to pouring rain and no electricity. So why should this be such a disaster, you may ask? Well, what if I told you that when I went to bed at 9 o’clock the night before it was raining and there was no power. The first thought I had as I awoke that morning was, “Do I have to face another day of this and can I?” I began to plot my escape. I guess I should back track here a bit and fill you in on some of the details leading up to this bleak picture. 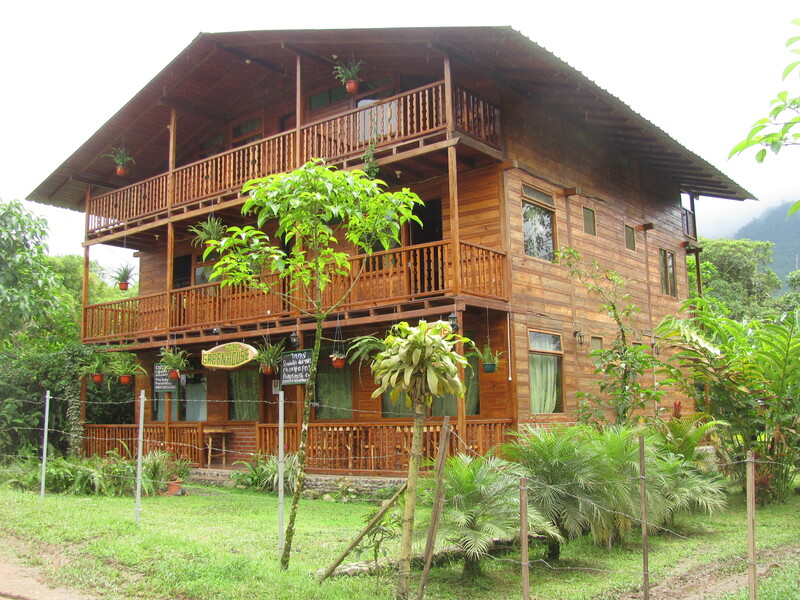 I arrived in Mindo, a small village in the Cloud Forest region of Ecuador, last Wednesday. It’s been raining every day since. Only now as I begin to write this post on Sunday is the sun coming out and looking as though it might last for most of the day. It was yesterday that I was planning to escape to Quito for some sun or at least something to do which I couldn’t see happening here if this rain kept up. However, just when I was getting very serious about following through with my escape plan, the sun did decide to come out (for a little while) as I was eating breakfast. The one thing I have learned about Ecuador by now is that nothing, and I mean nothing, ever happens as you would expect it to. No sooner had the staff stated that we wouldn’t see power until at least noon, the lights flickered back on. That did it for me. I decided I was ‘jumping the gun’ in deciding to leave without giving this place a chance so I went back to my room, grabbed my walking shoes and camera and set out to do some hiking on my own with some advice on where to go from Luis, the owner. I am glad I did. 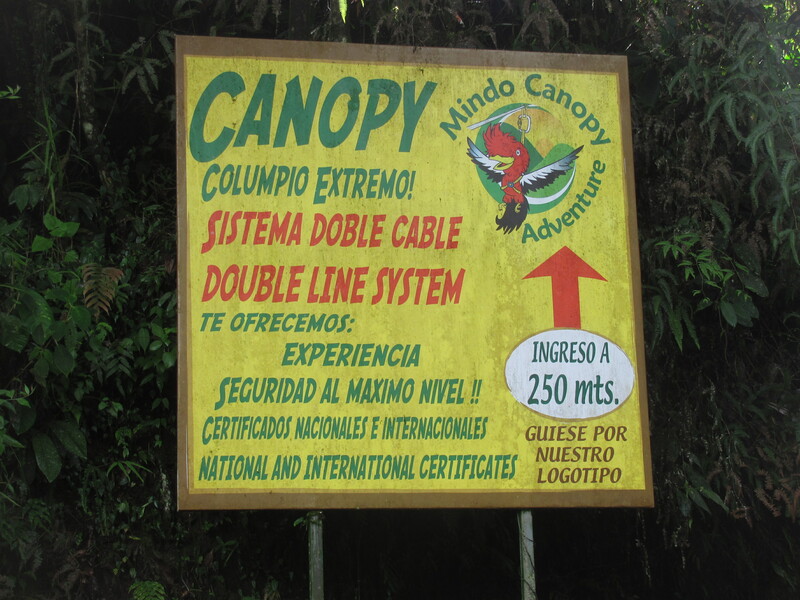 My walk ended up on the top of the mountain overlooking Mindo where canopy rides with zip lines are the attraction. I’m sure if there had been a person there instead of two unfriendly dogs I would have considered giving it a try. As luck would have it, I was probably fortunate that no one was there because shortly after I heard from a young 23-year-old staying at my place that she didn’t enjoy it because the young folks running it were forcing her to take positions she really didn’t want to take. 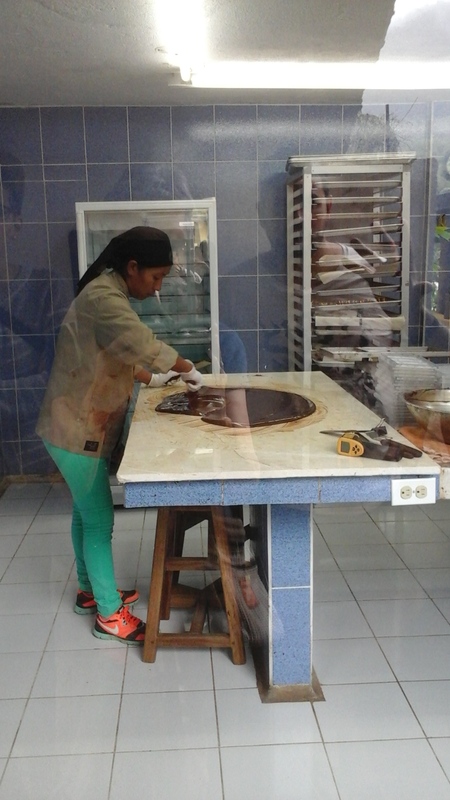 Instead of feeling exhilarated by the experience as those Cathy and I had met in Banos did, she felt pressured. This gal was very savvy for her age so I took her word for it. Gushing Rio Mindo after all the rain. By the time I got down the hill, I had walked about 10 km. It was well worth the effort because not only did it put me in a better frame of mind, but it gave me an opportunity to think more clearly about my life and where it is going. Nature seems to do that for me; it gives me time to reflect on the things in life that matter. Now, I am finishing up this post two days later as I get ready to fly back to Buenos Aires. 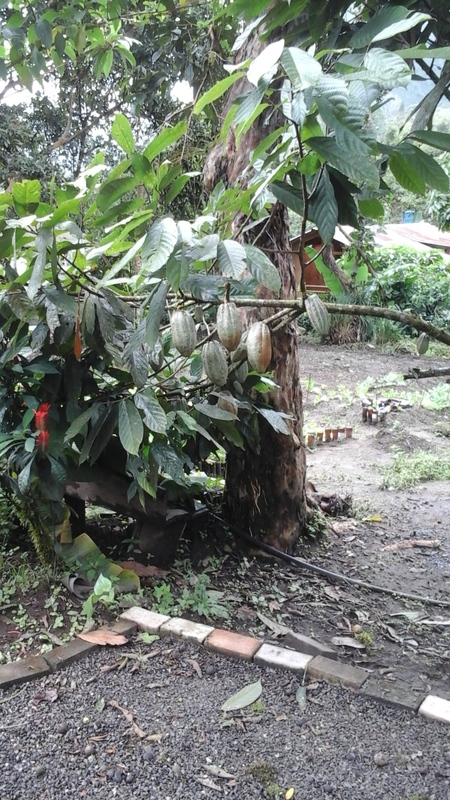 Mindo was certainly not the highlight of my two months in Ecuador but only because of the rain. I found out that I don’t adjust well to a sub-tropical climate especially in the rainy season. I couldn’t get used to my damp clothes. I am certain that if I had stayed longer I would have sprouted out in mildew. However, I did succeed in getting a mild sinus infection from it. By opting to stay I did manage to see some of what this little place has to offer. For instance, I saw many species of hummingbirds of all shapes and sizes. The downside is I did not get to see any toucans or the very rare long – wattled umbrella bird which looks like a crow with a black wattle and an Elvis quiff. 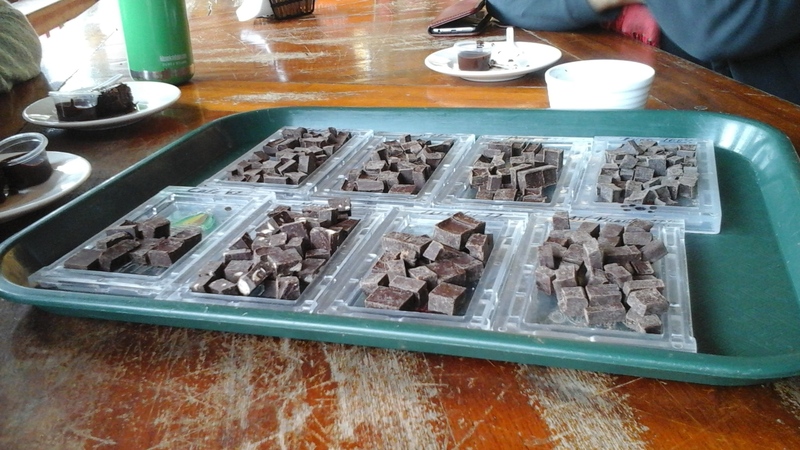 I also took a very informative tour of a chocolate factory where we not only saw the process of making pure unadulterated chocolate from start to finish, but also got to sample all the chocolate made there in all its forms from the nibs, to the chocolate flavours, the syrup, the tea, and a brownie to die for. It was amazing how energized I felt by the time it was all over. Our guide was right. 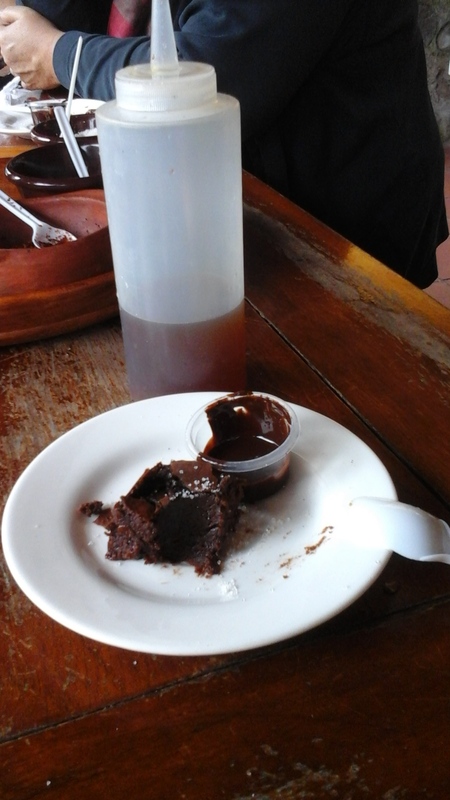 Eat this kind of chocolate every day and you could easily live to a hundred years or more. I was sorely tempted to go back for a few more tours at $6 a shot (senior prices) just to keep my energy up. 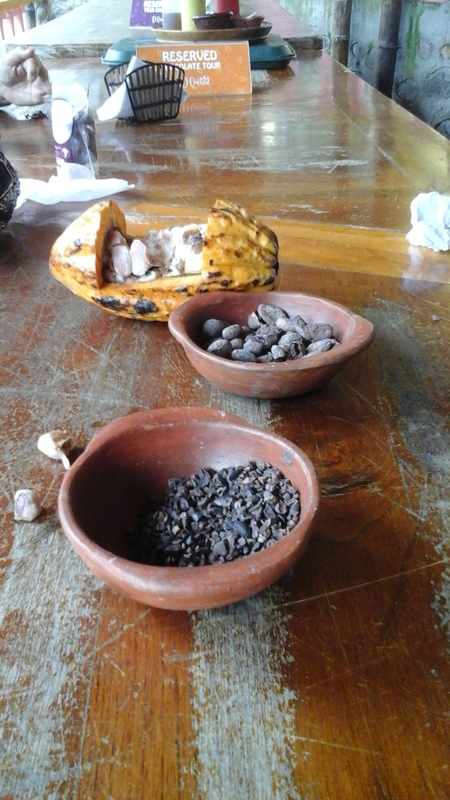 !st stage – the raw cocoa beans. Finished product and our samples. Finally on my last few hours on Sunday, my last day there, I had to get out and get a few more hours of the remaining sun before the rain started again as it did in all its fury. 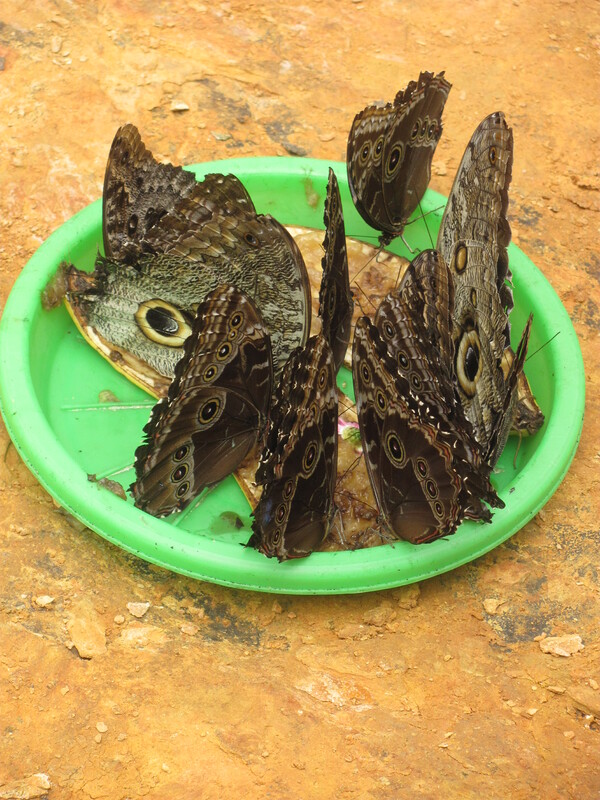 I decided to take in one of the many butterfly farms in the area – the Maraposas de Mindo. This was another fairly long walk of 3.5 km. but, hey, what better way to get some exercise and to get the adrenaline moving? The walk was great but I wasn’t overly impressed with this farm. First, I thought it was way overpriced for what I saw. I’ve been to many such farms and seen much better. We were given a very short explanation of the various stages of the butterfly and then just directed to a fairly large enclosed garden where various types of butterflies were flying about. There was no real information after that except for the odd sign stating in Spanish the type of butterfly that we might see. That said, it certainly was very colourful thanks to the blue morpho which could be seen madly flitting about all over the garden. With the eye they made a beautiful display but were impossible to capture on camera. Didn’t get the name of this one which has some blue when his wings were open. 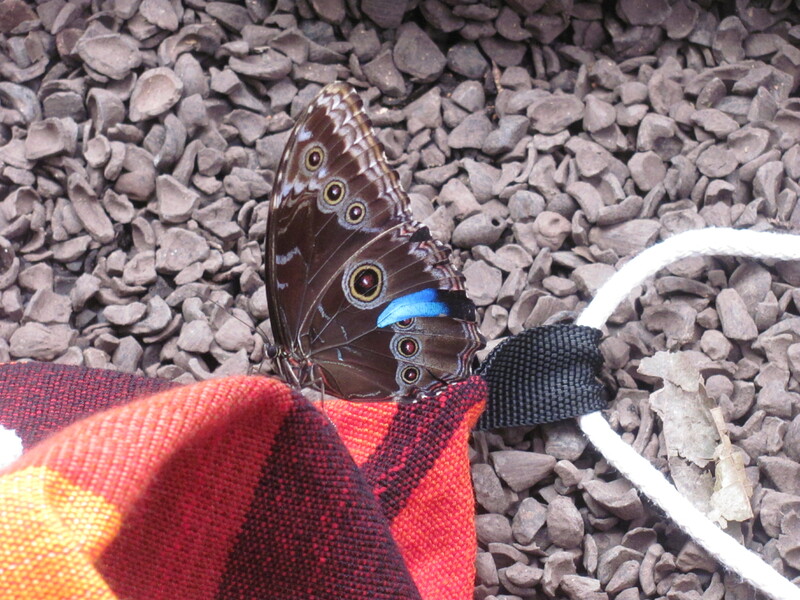 The Blue Morpho who finally settled for a little while on my bag. 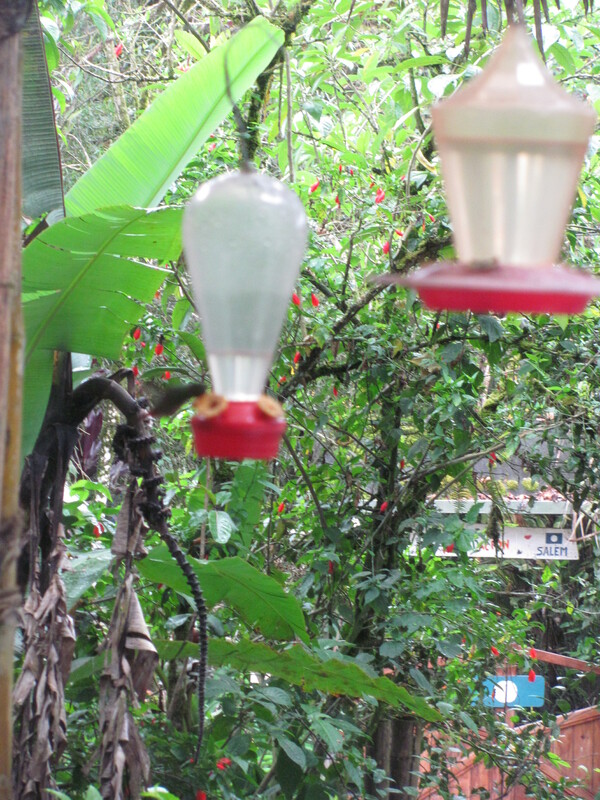 There are other things to do and see in Mindo such as, taking in an expensive bird tour if on your own but if with others gets less expensive depending on how many are in your group. 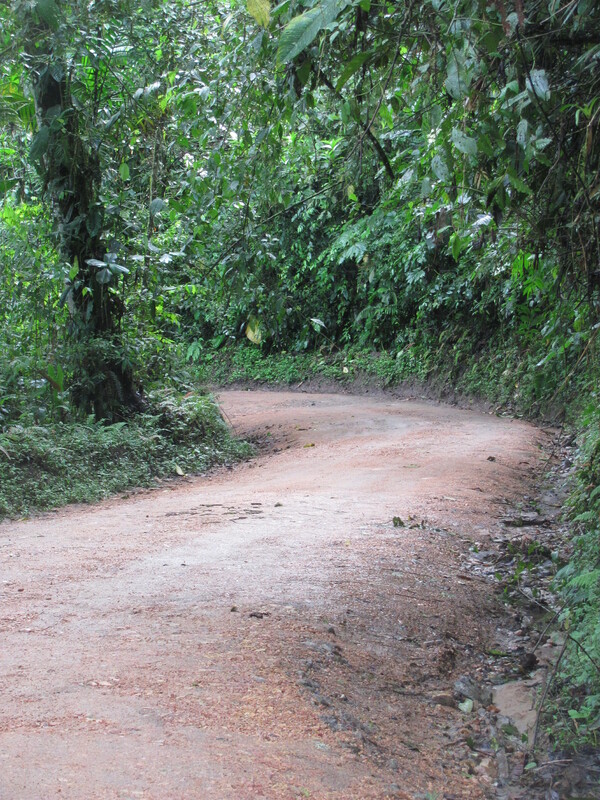 If really adventurous, you can try zip lining as I already mentioned, or go on guided overnight hikes right into the cloud forest, or try tubing. There are probably lots more adventures I have not mentioned. It’s one of the best bio-diverse areas in South America so has everything for those who appreciate what nature in all its glory has to offer. Just don’t go in the rainy season and especially in an El Nino year as this year is because you really won’t get to enjoy it as it’s meant to be. One of many Swiss styled houses. With the abysmal performance of our Canadian dollar, you have to wonder why I am literally running into Canadians every other day while I have been travelling around Ecuador. A few weeks ago on my first visit to Cuenca all the guests, except for one young female from England, were from Canada. We had a solo woman traveller from Alberta, a couple from Saskatchewan, another couple from Manitoba, a couple from Ontario, and Cathy and me from Nova Scotia. Previous to our arrival, our hostess announced that she had just had a couple from Montreal stay with her. Bonding very quickly over the horrible weather the folks back home were experiencing, it became an old home week for us all. It’s probably a good thing there was no one from the US as I’m sure they would have felt outnumbered. I’m not exactly sure for the reasons for this influx of Canadians this year, but I can guess at some of them because they’re probably similar to my reasons for being here. For years I’ve been hearing how inexpensive it is to live here or to visit for that matter. That still seems to be true, although it’s not surprising that costs are creeping up here as they seem to be world-wide. Even though our dollar is not performing very well right now, Ecuador is still affordable. As a result, Canadians are trading in Florida and Arizona for their winter escapes and looking at Ecuador as their next possibility. For ex-pats or would be ex-pats it’s the perfect place to come to. The present government, under Rafael Correa, has done much to make it easy for people from all over North America and some from Europe to make this their home. They are finding that their retirement fund goes a lot further here. In fact, many of them can honestly tell you they are living in the lap of luxury compared to how they would be living back home. Depending on where they choose to live and how, a couple can live quite comfortably on $1200 or more a month. I must point out that not all ex-pats are retirees. 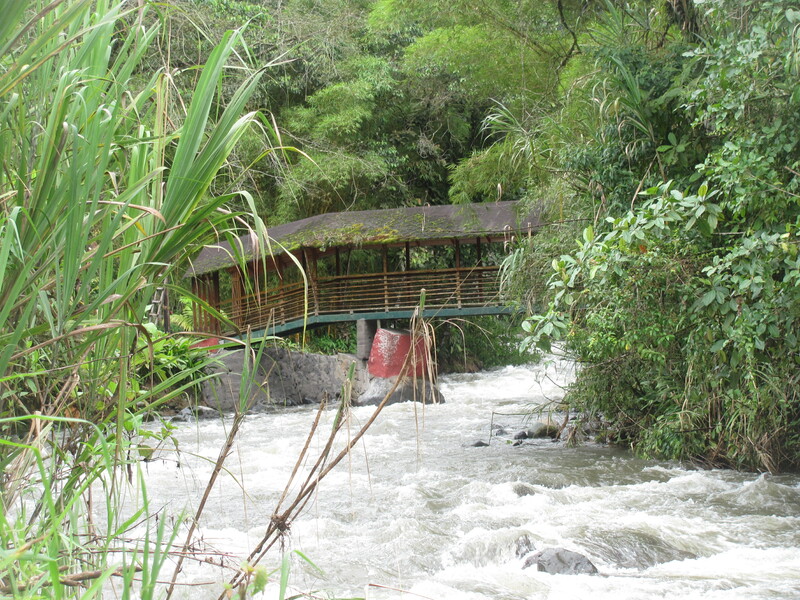 There are many young people, some with children, opting to make Ecuador their home. The younger ex-pats want a simpler life and definitely don’t want to take part in the ‘rat race’. The want a cleaner and safer environment so have chosen to buy land here and try their hand at farming. 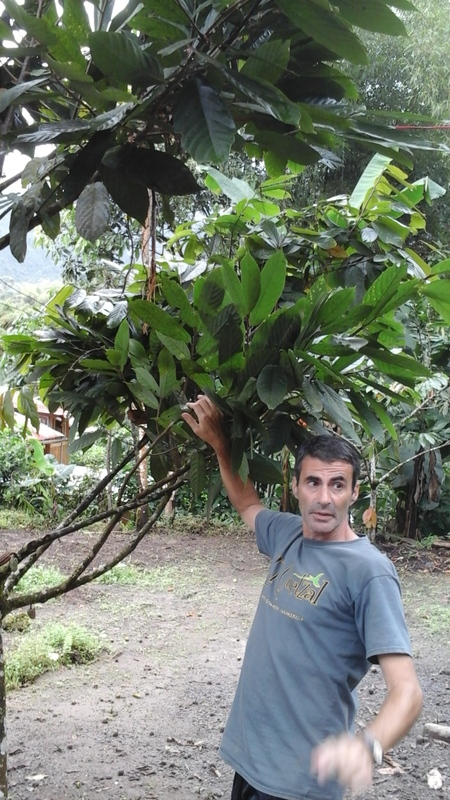 I saw that in Vilcabamba and Cotaccachi, both small towns where things grow like crazy all year round. Some retirees have set up their own businesses such as restaurants, food companies or whatever their interest happens to be. There are many opportunities here for anything in the exporting field since the country is rich in resources. The present government has encouraged ex-pats to come here by making it easy for them to buy property, set up a business, get access to good but inexpensive health care, and by providing seniors’ discounts on transportation, museums, and concerts, some of which are free. It’s not surprising that the weather plays a big part in why people are choosing to live here. Wouldn’t you be lured by what can almost be described as living year round with ‘eternal spring’!The whole country has the equator running through it so was aptly named from the Spanish word meaning equator. You might think that this would mean the country would be terribly hot but not so. It can be very humid down on the Pacific coast at sea level, but the rest of the country can legitimately claim to have an ideal climate where it’s not too hot or too cold. Temperatures can vary somewhat with it being a bit cooler in the north and warmer in the south, but always a moderate climate is enjoyed if you live in the middle which is higher up in the Andes. In fact, if you climb up to the top of any of the numerous volcanoes here, you will need to dress very warmly as temperatures can go down to the single digits. From January to May is the rainy season which isn’t always the best time to visit if you are a sun-seeker. The weather can be extremely changeable with sun, cloud, and some rain all in one day. Let’s just say I would hate to be a weather forecaster in this country! In spite of this weather uncertainty, there is always the consolation that there is never any snow to shovel. There is nothing boring about this country. For beautiful scenery, it is fantastic. It has mountains and volcanoes galore, lush green valleys, tropical forests, cloud forests, numerous rivers with grandiose falls, and gorgeous beaches. It’s an adventurer’s paradise. It’s biodiversity is apparent with more than 25,000 plant species and 1,600 types of birds, more than any other country in the Western hemisphere. The numerous tribes of indigenous people along with the Spanish and mestizos provide a colourful and vibrant culture. For visitors and ex-pats alike, there is much to see and do for such a small country. I might add that the country is still relatively healthy environmentally although signs of pollution from the poorly maintained buses isn’t helping the atmosphere especially in the cities. 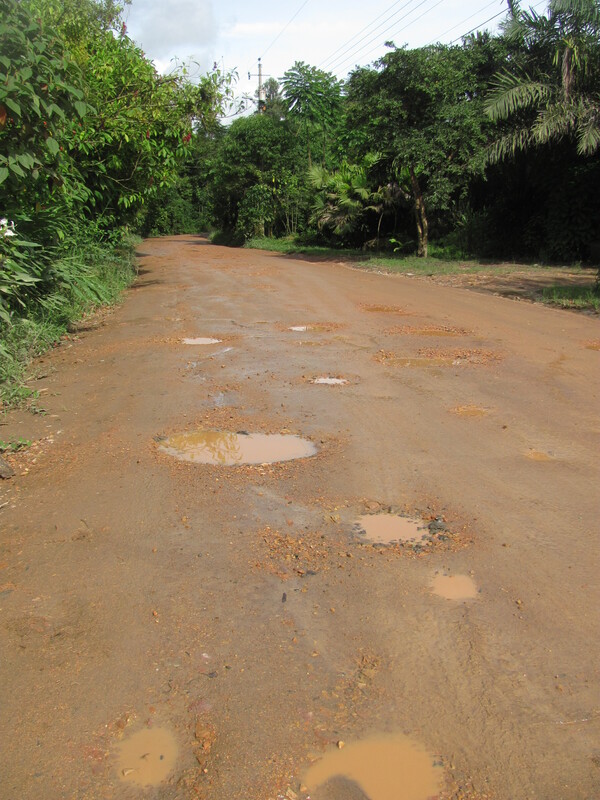 I am sure there are other atrocities going on as we might suspect in the Amazon region with the discovery of oil there in the 1960’s, and the government’s seemingly lack of will to stem the exploration despite the protests from the indigenous tribes who live there. There is a movement afoot which is gaining momentum to allow them to limit the rampant growth so they can live sustainably. Sounds to me like Ecuador is facing the same problem here as we do in Canada with our Tar Sands. The money reaped by their oil discovery has just been too lucrative for the country’s coffers to seriously do anything about it. Generally speaking Ecuadorians are friendly people who are genuine in their response to all the new comers arriving in their county. This does, of course, make it much easier for ex-pats to set up a new life here. The welcome mat is obviously out for them. Some are more successful than others at integrating into the local culture. 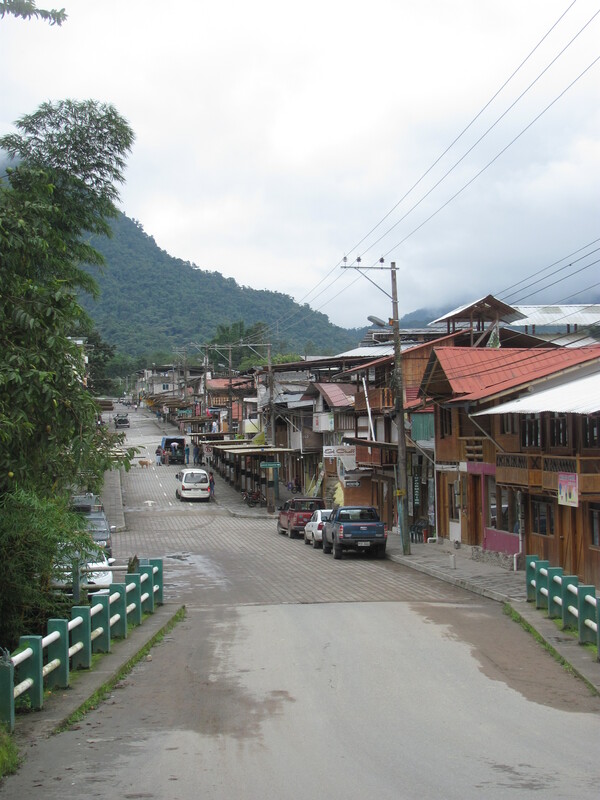 The one place which has a large number of gringos (the polite word used by the Ecuadorians to describe anyone, not just Americans, who move here) in proportion to the population which is about 4,000 is the town of Cotaccachi not far from Otavalo. The day Cathy and I decided to visit, I was amazed at how the ex-pats or gringos seemed to not only take over the market but were also forming groups in many of the restaurants. It appeared obvious that they had unwittingly taken over certain restaurants, thus, claiming their turf. We felt entirely ignored so I can imagine any local would feel the same way. My sensation of this was later backed up by Miryam, my hostess for the AirBnB where I have been staying. She claims there is a tension between the locals and the ex-pats. It’s unfortunate this has happened in Cotaccachi as I personally think that Ecuadorians are extremely friendly and helpful and in most cases go out of their way to make any visitor to their country feel welcome. Of course, there are bound to be those who want to take advantage of us with their petty thievery, but this isn’t surprising since there are many who are still poor and lacking in education. Nevertheless, this country has come a long way in improving its social services since Correa has been in power but still has some distance to go in narrowing the existing disparity between the rich and poor. Probably the most important question to be answered for me or anyone who thinks that Ecuador might be a good place to live is to talk to the ex-pats and get their responses. I found that the ones who were most positive were those living in Cuenca and Vilcabamba. The most exuberant person was a lady I met at the Central Plaza in Cuenca who moved there from Ottawa four months ago with her husband. 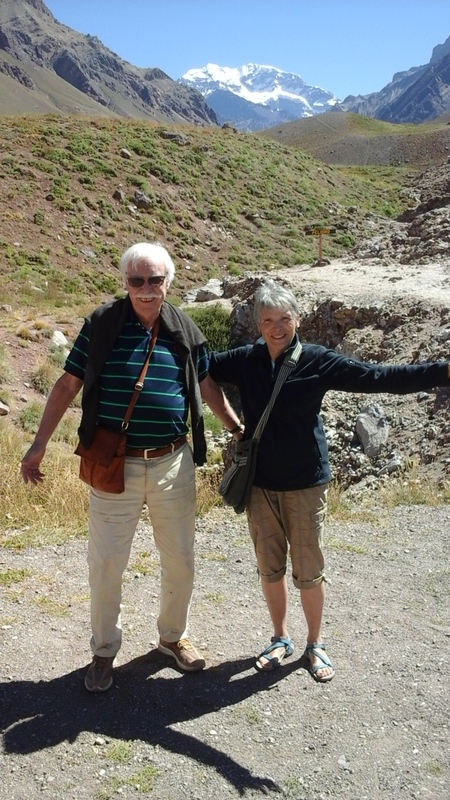 Here was a couple in their early 50’s who sold their home and most of their possessions to live in Cuenca. They were not looking back and loving their new life for all the reasons I have suggested. Their one big challenge was to learn the Spanish language.This I have to agree has been a real hindrance for me in getting to know the people and the country better. The Americans are further ahead of us in this as most of them have had experience at speaking Spanish in their own country. Then there was the couple from Toronto in their 80’s. I met them while having lunch one day in a fancy restaurant offering a terrific luncheon special. They were visiting Cuenca to check it out places to rent. Once they found a place, they were going to make the big move. The wife was regaining her youth again so much so that she was actually taking up sky diving and loving it. She also added that her husband had lost 20 pounds in the two months they had been there from all the walking they had been doing. Amazing! I hope I can be like them in my 80’s! There is much more I could write about this country. I hope that my impressions of why Ecuador is gaining a good reputation as a place to move or retire to if you are looking for a lifestyle that will be easier and more affordable are sufficient to whet your appetite just a wee bit. Or better still, why not consider it as a country just to visit? There really is much more here than the Galapagos! Monument at Midi del Mundo to mark the equator. Lake or laguna near Cotacatchi.